Southern charm meets western ingenuity in the new Comet Series from Boyd Lighting. California-based Boyd Lighting partners with well-known and talented designers from across the country like Jamie Drake, Barbara Barry, Roger Thomas and Windsor Smith. This fall, Boyd welcomes a firm with southern charm to the design family - HTK Design. The Comet Series designers from HTK Designs hail from High Point, NC. Based in High Point, NC since 1961, HTK Design is well-known for bold and creative statements in both contract and residential markets. HTK’s staff of designers, illustrators, and engineers draws inspiration from a variety of sources; fine art, architecture, nature, and global travels all influence their work. Their designs have been produced by some of the most influential manufactures in the world, and their Comet Series of fixtures for Boyd Lighting represents their first foray into lighting. The three piece Comet Series is a masterpiece of design and manufacturing. The Comet Chandelier, Comet Sconce, and Comet Sconce Double all feature bark-like, cast elements juxtaposed against machined parts for a dynamic push-pull between organic and refined. 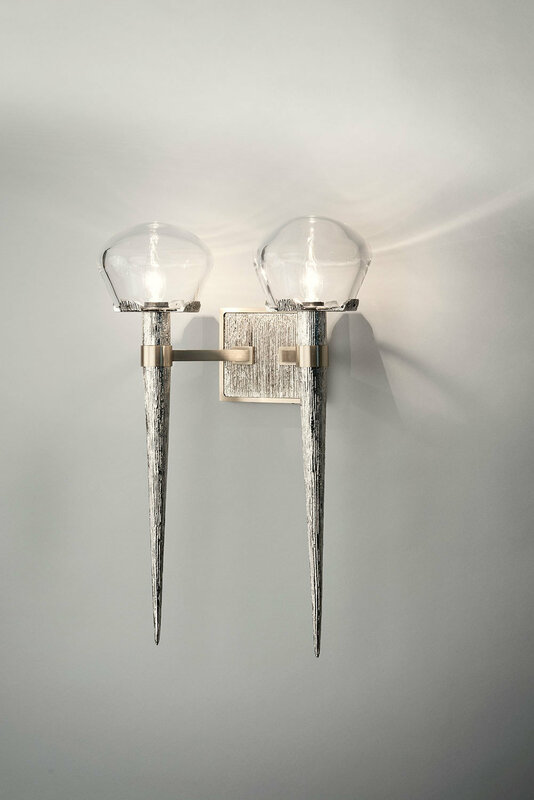 The over-scaled pieces - the single Sconce is almost 23” tall and the Chandelier is over 5 feet long – feature a striking spike and diffusers of ¾” heavy-weight blown glass that can be ordered in either clear or inside frosted versions. With brass and nickel finish options, the Comet fixtures can be configured in numerous finish combinations. Staggered on either side on a beam extend 8 machined arms which holds textured spikes. 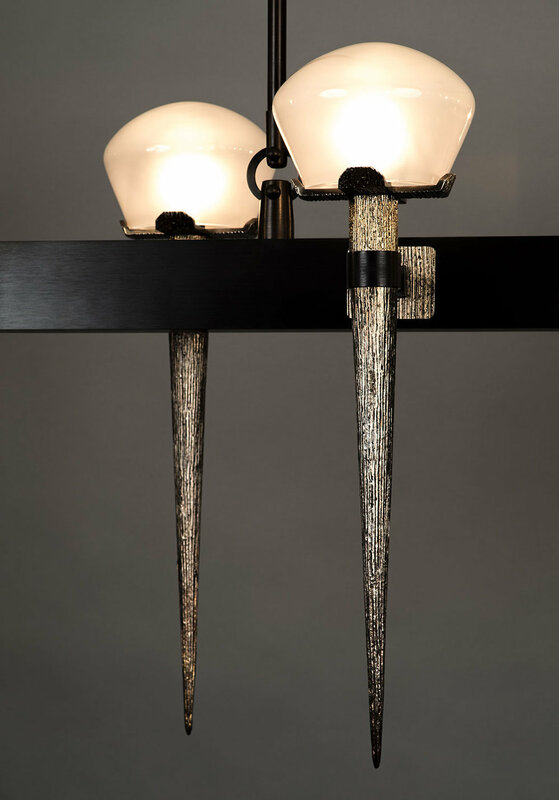 On top of each spike is a matching textured cradle which holds either a clear or inside etched glass shade. The two-toned, breathtaking chandelier measures almost 23" tall and 63½" long. Choose one of five finish options for the textured parts (Spike, Canopy, End Caps, Medallions and Cradle) and one of six finish options for the machined parts (Arms, Canopy Frame, Hanging Stems and Beam). From a textured rectangular backplate extends one or two machined arms which hold one or two matching, textured spikes. On top of the spike is a matching textured cradle which holds either a clear or inside etched glass shade. The two-toned, breathtaking sconce measures almost 23". Choose one of five finish options for the textured parts (Backplate, Spike and Cradle) and one of six finish options for the machined parts (Arm and Backplate Frame). These are just three of the fixtures in Boyd Lighting's Decorative Series, new for Fall/Winter 2016. Also new for 2016 are three fixtures in Boyd Lighting's Architectural Series.